Lines at the post office on April 15 might be getting shorter thanks to e-filing but they are still a familiar view and the indication of tax season in the full swing. Americans file taxes each year on the 15th of April, with some exception to the rule. Whenever the 15th falls on a weekend (like this year – Sunday) or on a holiday (like this year – District of Columbia’s Emancipation Day) the deadline is pushed to the next business day. In 2012 it was April 17; in 2013 we’re back to April 15. Federal and state tax dates coincide for the most states with few exceptions, nevertheless they have to be submitted in April (except for Virginia – May 1st). But what to do if you’ve run out of time to file your tax return? Fill out form 4868 and mail it to the appropriate address (make sure to check page 4 as the address depends on where you live and whether or not you’re making any payments). 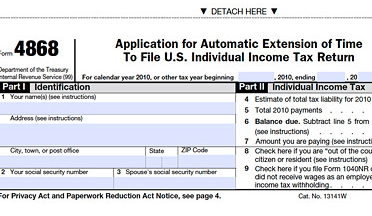 Fill out the same form and file it electronically with IRS e-file. Make a complete or partial payment of your estimated tax due with your credit/debit card or by Electronic Federal Tax Payment System (EFTPS) – IRS will send you a bill for the outstanding balance. Form 4868 can also be accessed here from the IRS.gov website if you prefer to e-file the extension. The extension might sound intimidating but the form is very short (just nine fields mostly related to your personal information and your estimates of the current liability) and includes all necessary instructions. You do not owe anything but rather expect a refund – there are no penalties but any refund goes to the U.S. Treasury after 3 years of being unclaimed. Failure-to-file – the worst possible option – penalty is set at 5% of what you owe for each month with a minimum of $135 up to maximum of 25%, a very high price to pay for ignoring the responsibility. Failure-to-pay – not as bad as the previous choice but still costly – you face penalty of 0.5% of outstanding obligations plus interest of 3% (current rate).